Riches to rags. … Chaos calms. … Crime quiets. … But does it really? First can I just say two things: 1. As much as I love Doreen, I do not want to hang out with her because man, she is a dead body/crime magnet. LOL and 2. As picturesque and charming as Kelowna, British Columbia seems, I would not want to live there. After all the crime rate and body count just keep getting higher. Seriously though, this was another absolutely delightful cozy mystery in this series. You do have to feel for Doreen. She is really feeling the pressure from the press, Detective Mack and the even the townspeople over these situations she keeps finding herself in. Hoping to stay out of the spotlight and to dial her notoriety back a notch, she has a plan. Of coarse nothing turns out as planned. Hilarity ensues as action-packed mystery begins. The adorable pet brigade and Nan make their return as well and the slow simmering attraction between Doreen and Mack continues to build. Such a wonderful series and an excellent book! Can't wait for the next one. With Mack’s willingness to help her find avenues to earn a living, while trying to keep her out of serious strife… Doreen finds herself researching the local council’s gardening competition for gardening idea’s and inspiration to further her plans as a professional garden landscaper… oh boy does she find more than she could ever imagine. Doreen… our intrepid, wanna be? 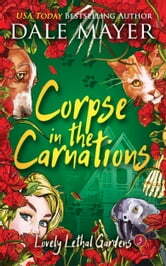 amateur sleuth is at it again in CORPSE IN THE CARNATIONS - Lovely Lethal Gardens - Bk 3. All it takes is a harmless research trip for gardening inspiration, to find herself in all sorts of bother that will have bullets flying and more mystery to solve. Don’t forget that body you find amongst the carnations. After a prolonged time of being subjected to her ex-husbands control… this lady is growing her wings, setting down roots, and learning to fly. She is a most curious soul at heart. And you thought her darling menagerie of animals could behave themselves for just a moment? No… they are back finding more in this creek. The creek that’s holding a wealth of secrets. Dale Mayer continues to weave her magic with this series and her wonderful cast of quirky characters. Readers are afforded heart breaking cases, solving a mystery or two amid fun, quirky banter, and hilarity at the same time. They are a wonderful, page-turning escape to brighten your day, Doreen style. I highly recommend this new series. If you love mysteries and humour this book delivers… I’m looking forward to what await’s Doreen. The series just keeps getting better and I cannot wait for Daggers in the Dahlia's. I have to see what is happening with the antiques and now people are sending Doreen request to find missing loved ones. She had no idea she would get a reputation for finding bodies and bones. Closing cold cases was the furthest thing from her mind when she went to live in her Nan's house. Her Nan';s house is so full of stuff, and to find out quite old and valuable but its not her cup of tea. Now what to do with all the stuff. Then of course there is Mack. I received a free copy of this book via Booksprout and am voluntarily leaving a review. Trouble seems to follow Doreen, even when it appears that things have calmed down, though reporters still watch her, waiting for her to find another body part and then treat her as if she’s somehow responsible for the murder. Mack has nixed Doreen’s desire to perhaps get a job helping him in case-solving since they made such a good team in working through the bones mysteries. Fortunately, the Kelowna City Council is running a competition among locals to create a beautiful flower garden at the entrance to the city. Sounds innocent enough, yes? She is thinking carnations. Due diligence requires that Doreen visit florists to assess the feasibility in cost and color selection. In her travels, she comes across a man and woman having what seems a disagreement and then driving off separately but in the same direction. Her curiosity demands that she follow along to assure herself that the man in the truck is not following the woman to do her harm. When she sees them enter a building together, she realizes that her imagination must be in hyperdrive. She then proceeds to the city entrance to view the place where the flower garden will be. Can you guess what she finds there and whose it is? I received a free copy of this book via Booksprout and am voluntarily leaving a review. This book was an absolutely hilarious ride from start to finish. Being a female that didn't really learn to cook until I left home, I can relate to Doreen being afraid of her stove haha. Poor Mack will be grey haired within a month with all the stress he takes on just being a friend to Doreen. The nicknames Doreen is being given are rightfully earned and hilarious. She hasn't lived in Mission for very long but she's already making a name for herself. Not to mention the money she is making for her Nan with all the betting going on at the retirement home. 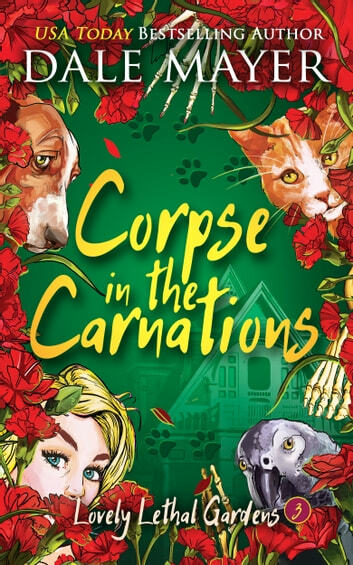 Doreen and her little family of furry and feathered assistants will having you laughing out loud while you try to figure out who is responsible for the murder. Trying to read this late at night and not wake up my hubby wasn't easy, what with all the giggling and outright laughing. I'm completely hooked on this series. Highly recommend this series to cozy mystery lovers. You won't be disappointed! I received a free copy of this book via Booksprout and am voluntarily leaving a review.